Vegetarian Bolognese—let’s talk about it! This recipe is packed with flavor and wholesome ingredients. With most of the “bulk” coming from eggplant and mushrooms, this hearty pasta sauce isn’t just for those who stick to a vegetarian diet. It will surely satisfy everyone. How do you make vegetarian bolognese sauce taste “meaty”? 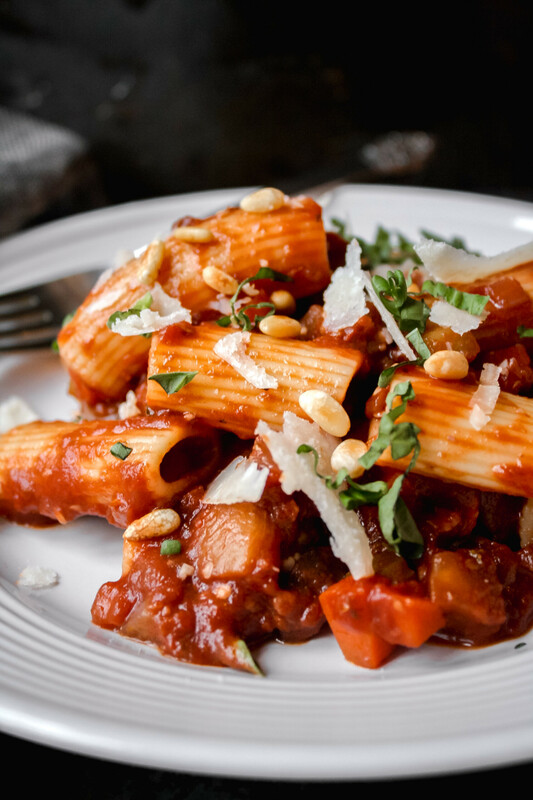 The key to making a vegetarian pasta sauce taste meaty without the meat is to rely on vegetables that take on a meaty texture, and flavor, when cooked. The king when it comes to tasting “meaty” is almighty mushroom. Once cooked, mushrooms offer a meaty texture to whatever they’re added to. Likewise, when cooked down and allowed to release excess liquid, eggplant also adds that classic meaty texture to bolognese sauce. What pasta should you serve bolognese over? 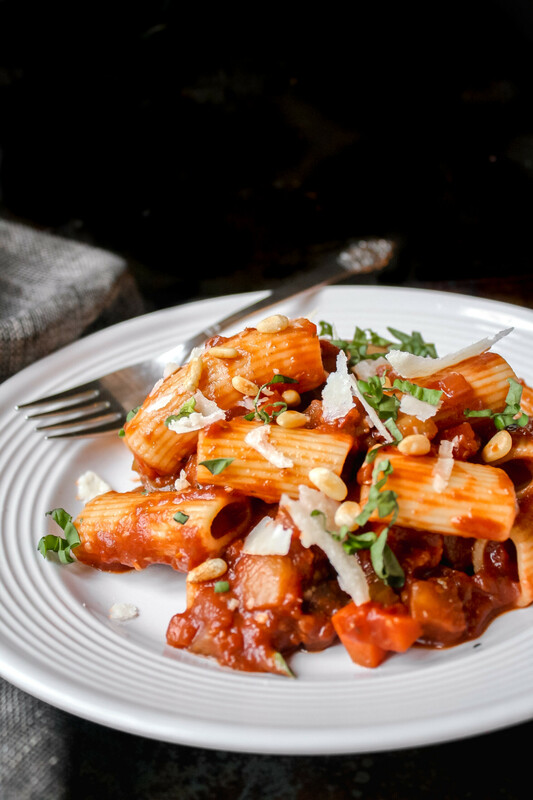 I like to serve this vegetarian eggplant bolognese with a pasta that has a lot of surface area, like rigatoni or pappardelle. These types of pasta are the perfect vessel for holding a lot of sauce. However, like with all of my recipes, use whatever you have on hand or prefer most! Heat 2 tablespoons olive oil over medium-high in a dutch oven, until hot. Add eggplant and cook, stirring frequently, for 5 minutes until browned and softened. Transfer eggplant to a medium bowl and add remaining 2 tablespoons of olive oil to pan. Reduce heat to medium and add onion, celery, carrot and mushrooms. Cook for 8-10 minutes until vegetables are softened. Add garlic and red pepper flakes and cook for 1 more minute. Add tomato paste and cook for 2 minutes, stirring frequently. Deglaze pan with ¾ cup of wine and add tomatoes, eggplant, oregano, thyme, ½ teaspoon salt and ¼ teaspoon pepper. Bring to a boil then lower heat and simmer for 10 minutes. Meanwhile, bring a large pot of water to a boil, add a tablespoon of salt and the pasta. Cook according to directions on package until al dente. While pasta is cooking, add remaining wine and basil to sauce. Simmer for an additional 10 minutes. 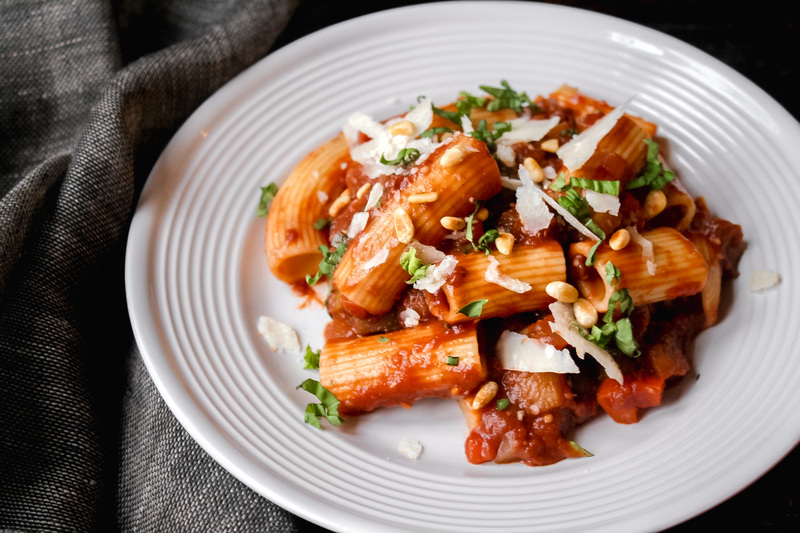 When ready, drain pasta and transfer to a large serving bowl, add the sauce and top with Parmesan, basil and pine nuts.